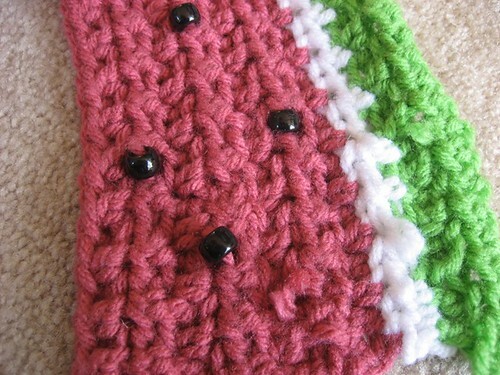 Gege Crochet: Winter watermelons are the best! Ah yes...summertime... 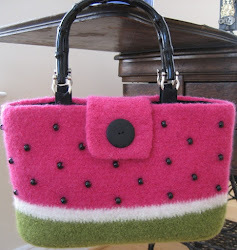 Bright sunny days, everything's in bloom, and you just want to enjoy a nice, cool, juicy slice of watermelon. The refreshing juice bursting in your mouth and dribbling down your chin... the firm red flesh satisfying both your hunger and your thirst....the awesome spitting contests you totally win each and every time (and sometimes even using watermelon seeds!). Awww yeah....watermelons are the best. 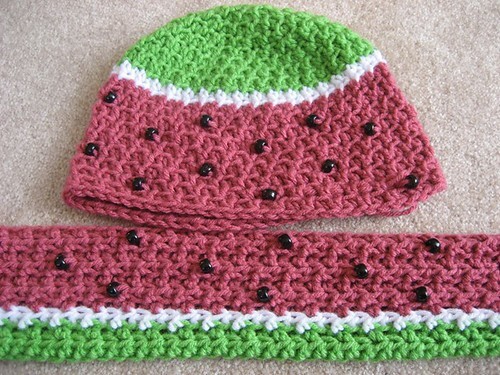 Ahem....back to the watermelons.....I then had to think of how to make a watermelon hat, with the seeds, and make it look different than other crocheted hats. I love the creative process. 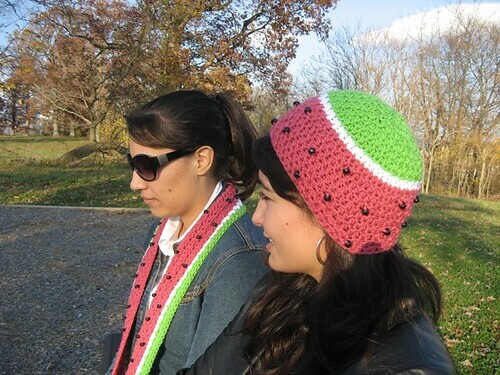 :) Once I figured it out, I decided I couldn't just make her a hat and not have a scarf to go with it, now could I? 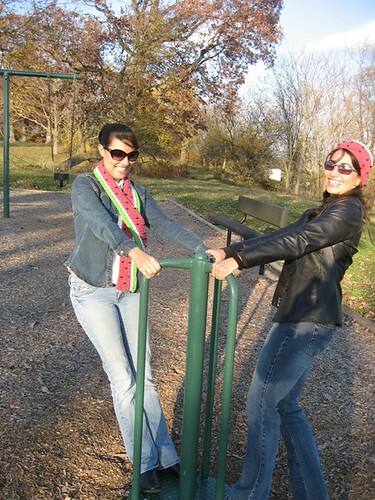 And, of course some ACTION SHOTS!! POW POW! That's an adorable set. BTW I totally get the Emperor's New Groove reference. I love that movie and now I'm going to have to go through dd's dvds to find it. I love this set, its adorable. BTW I totally get the movie reference. That's one of my favorite movies ever! RusticOkie, Squeak, squeakity squeak squeak, squeakums. HA! I love Kronk! What an awesome set! 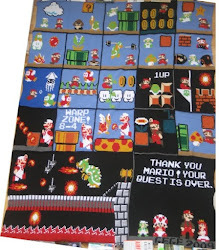 Saw it on Craftster. It's very unique and cool. "Bee dooby dooby doo, doo doo, doo do..."
"Oh, no, he's doing his own theme music?!?! I am SO glad I was asleep during this part!" I love this set. Its too cute with the pony beads for "seeds". Adorable! I'd like to thank you for sharing this project, I am a beginner and I did the scarf for my son - not watermelon, but a tweed kind of yarn. I love the texture of the pattern. God bless you and I wish you a great 2011! Thank you Elaine! 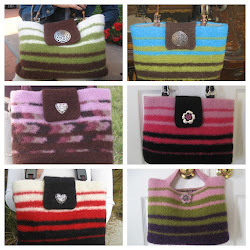 I love hearing back from people who have made items from my patterns. 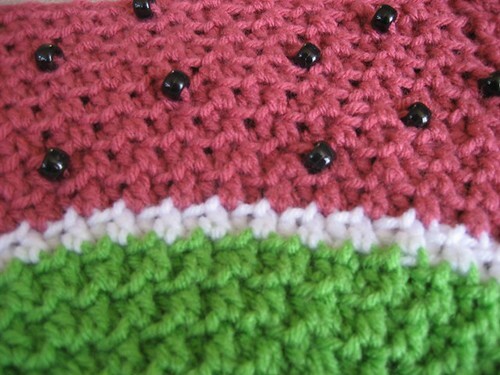 :) I really loved the texture this stitch combo made, too. Kinda mixed it up from just straight crochet, which makes it a little more interesting. (Or at least I think so) :) Thanks for stopping by!